With at least three active burlesque troupes in Indianapolis, we seem to be in the midst of a burlesque revival. While the average person equates burlesque with strippers, the art form started in the late 17th century as a form of parody with humorous dramatic, musical, or literary works mocking and caricaturing more serious works. By the 1860s burlesque came to America and during the height of popularity (1890s through the 1940s) the popular performances were often presented in a variety show format in clubs and theaters. The shows featured bawdy humor, two-person acts, comedians, musical acts, and seductive dances and teases performed by shapely ladies wearing risqué costumes. 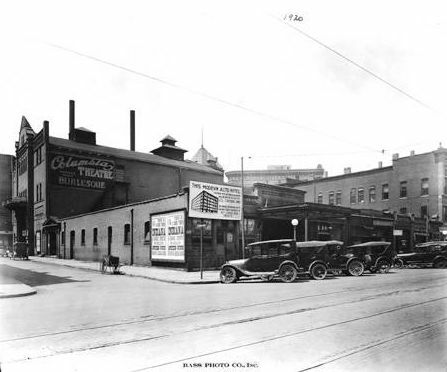 According to Howard Caldwell in The Golden Age of Indianapolis Theaters, burlesque started in Indianapolis at the Empire Theatre on Wabash Street in 1892. Lately I’ve been fascinated with several bird’s-eye views of Indianapolis at the Library of Congress. 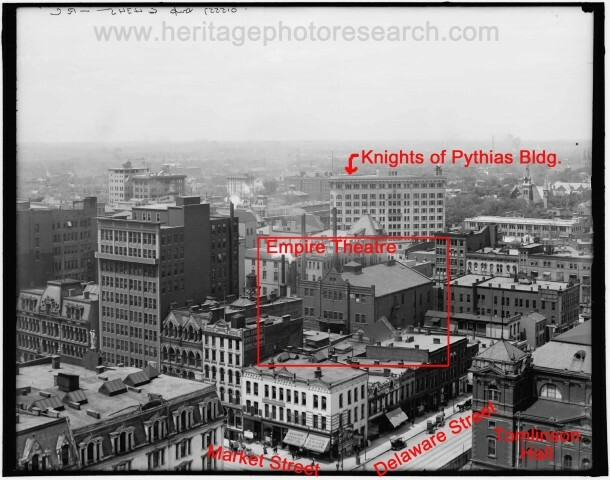 In 1907 a photographer from the Detroit Publishing Company climbed up the clock tower stairs of the Marion County Courthouse and made at least four views looking over the city. 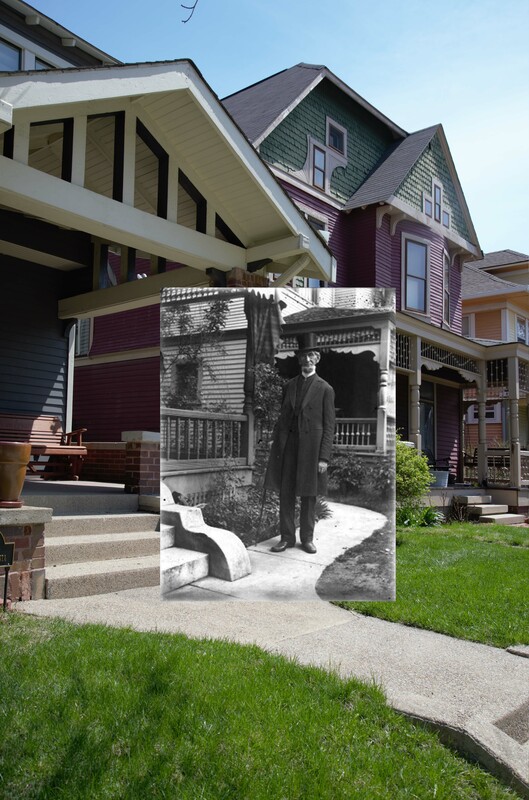 The amazingly clear glass negatives provide a great view of buildings, and show some that were rarely photographed. This image looks northwest from the Courthouse toward the intersection of Market and Delaware Streets. In the middle of the block is the Empire Theatre which was tucked away in a narrow alley (today named Wabash Street) making it difficult to photograph the building from the front at ground level. 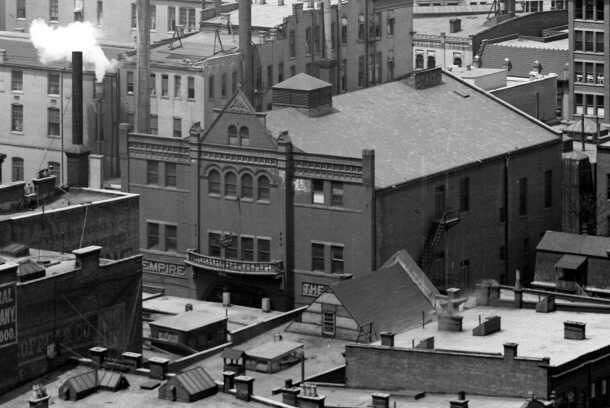 The Empire Theatre is clearly seen from this high elevation. The building was constructed for the Heuck Opera House Company of Cincinnati, Ohio and managed by James E. Fennessey, Charles Zimmerman, and Henry K. Burton. The Indianapolis Journal announced the theater’s dedication on September 5, 1892, describing in detail the pressed brick and terre cotta exterior and lavish interior. Although contractors Jungclaus and Schumacher completed the building in only seventy days, architect Oscar Cobb (a Chicago architect who designed over 200 theaters) stressed the safety of the structure with thirteen exits (another source says 22) in case of fire. Being a free-standing building, windows on all sides allowed for excellent ventilation. 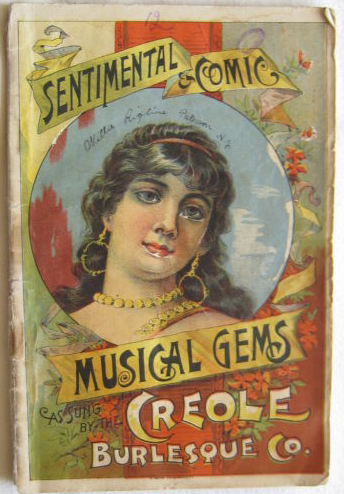 One of the troupes performing at the Empire for a week in late 1892 was Sam T. Jack’s Creole Burlesque Company, credited with introducing burlesque by African Americans (advertised as “Creole Belles” in Indianapolis newspapers). The show typically consisted of three segments: part one included an exchange of witty repartee between comedians and interlocutors and songs and dances by chorus members; part two consisted of variety acts; and third and most anticipated were the burlesque performances. 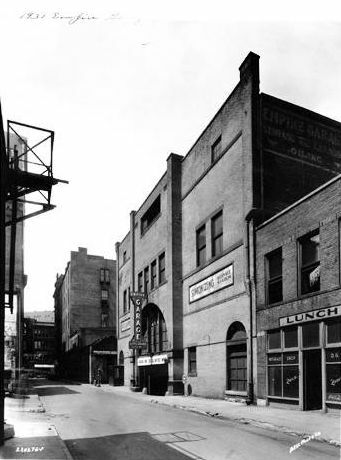 In its nearly thirty-year existence as a theater, the 2,100-seat venue hosted opera, burlesque shows, dancers, blackface, contortionists, local bands, wrestling matches, dramatic readings, vaudeville acts, traveling evangelist shows, and moving pictures. The place was not without controversy and policemen regularly ripped down or painted out sections of overly provacative posters of the burlesque girls. Regulars knew to attend the first night of a new performance before authorities learned of raunchy aspects and closed down the act. In January 1901, Chairman Hyde of the Board of Safety attended and was so offended by thesuggestive performances and obscene language that the threatened to revoke the theater’s city license. In 1913 the name changed to Columbia Theatre, as signage is seen in this 1920 view looking west on Wabash Street from Delaware Street. An advertisement from 1914 states that moving pictures were played every Sunday. The Columbia Theatre closed in 1915 and the building was only occasionally used. With a national press movement and religious backlash against increasingly racy performances, along with the enactment of Prohibition, many burlesque theaters closed in the 1920s and ‘30s. In early 1920 Wheeler City Rescue Mission, a Christian social service organization that helped the homeless and needy (and still operates today), rented the building by the month and used the stage for religious speakers and traveling evangelist shows. One can imagine that their staff and board felt that this was a more worthy and wholesome purpose for the theater. 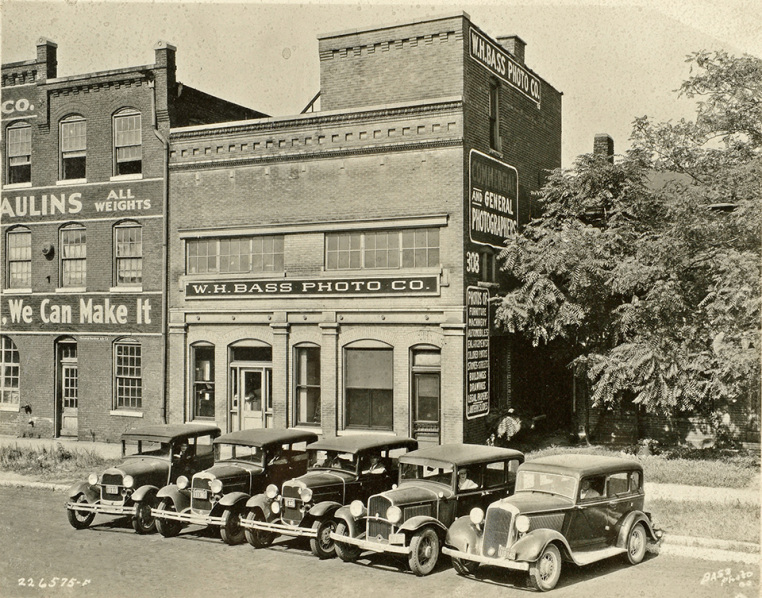 Newspaper advertisements indicate that after Wheeler City Rescue Mission left in the early 1920s, and the building had one last brief chapter as a burlesque theater with a few well-known African-American performers making the rounds. Ethel Waters, billed as the “Jazz Queen” performed for a week in January 1923 and Eubie Blake and his lyricist Noble Sissle (an Indianapolis native) performed with an all-black cast in the musical comedy “Shuffle Along.” The owners struck a deal to sell the structure as an “automobile hotel” in 1923 and the interior was gutted and filled with reinforced concrete floors and ramps. 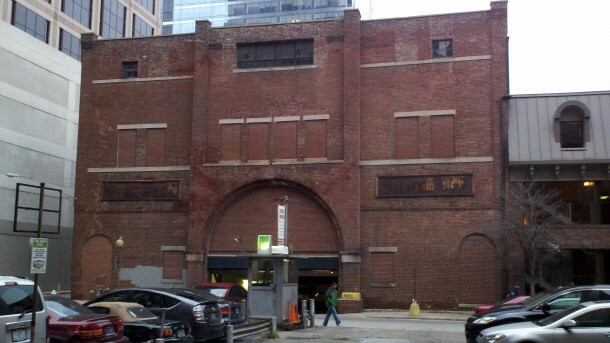 Alterations to the Empire Garage included removal of the decorative brickwork and arched windows near the roofline. Surprisingly the old theater built in 70 days still stands 123 years later, but is merely a shell since the interior was stripped decades ago. Although the arched entrances still exist, the balcony is gone and most of the windows are bricked in. Note that the faded and rusty old signs appear to be quite old. 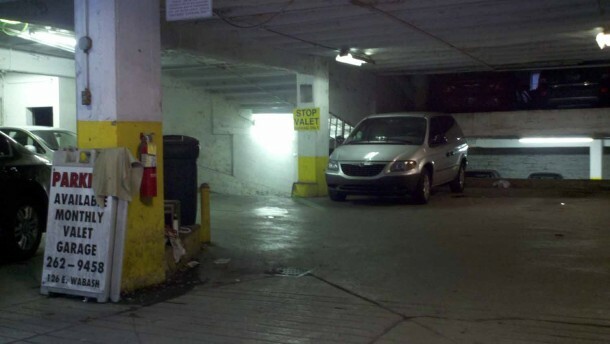 For nearly a century the old theater building has been a garage and today it is operated by Management Trust as monthly parking for downtown workers. Amid honking horns and the smell of oil I tried to envision walking through three double doors entering into a foyer flanked by open stairways leading to the balcony. Despite the addition of concrete ramps I imagined the excitement patrons must have felt sitting in the three box seats on each side, hushed voices on the floor as the incandescent lights dimmed, while burlesque performers perfected their makeup and costumes backstage before making their entrance onto the stage decorated with gilded stucco and a large central painting of Roman Goddess Diana of the Hunt. Feeling the curious gaze of the parking attendant, who had never heard of the Empire Theatre, I left feeling sad that the interior was beyond preservation but happy that at least a few unexplored architectural remnants remain in our city’s back alleys. Joan Hostetler and John Harris own Heritage Photo & Research Services. The company specializes in house and building research and historic photograph preservation, interpretation, archiving, and digitization. 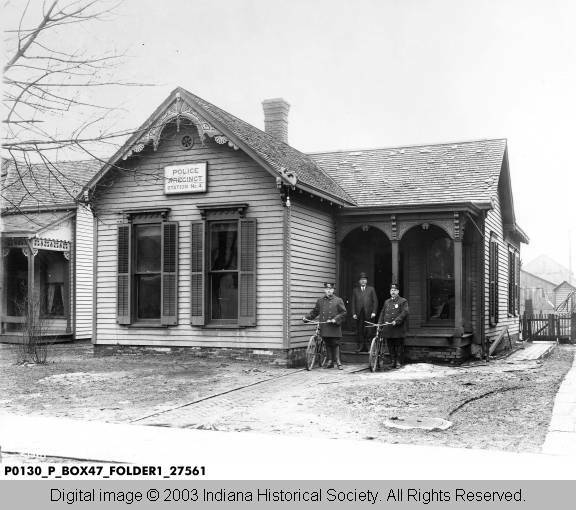 Since they see so many cool photographs tucked away in attics and basements, they recently created "The Indiana Album" to borrow, scan, and share hidden Indiana images with the public. Like them on facebook or send them an email to share your photographs. Nice post, Joan. Dad worked at and later owned J.S. Cruse Realty Co. at 128 N. Delaware. He frequented the Cozy, which I think would have been across the “street” and a little west of this building. He walked by it many, many times. I hope that you will do a post on the view taken to the NE. Our family were members of Trinity Evangelical Lutheran Church, on the NE corner of Ohio and East Streets. It would likely be very visible in that shot. Thank you as always for writing these articles Joan. It’s good to see that at least some of the old theater is still visible. I drove by one of my favorite old neighborhood movie theaters–the Daisy on West Michigan Street–the other morning and was horrified to see that the front part of the theater has been completely demolished. It was a little gem of an art deco movie house from 1938. I wish something could have been done for it. Thanks for your kind words, David. Was the Daisy near Haughville and on the north side of Michigan? I’ve always like that one and am sad to hear that it’s gone. Yes, that’s the one, Joan. I think that it was originally the Princess and was built in 1915. I just tried to confirm that with my book of Indianapolis theaters, but it looks like that was a victim of a Half Price Books purge. I always meant to go down there and get some photos of it. At least I’ve saved screencaps from a lot of angles on Google Street View. A friend of mine’s mother once told me she was an usherette there in 1941. 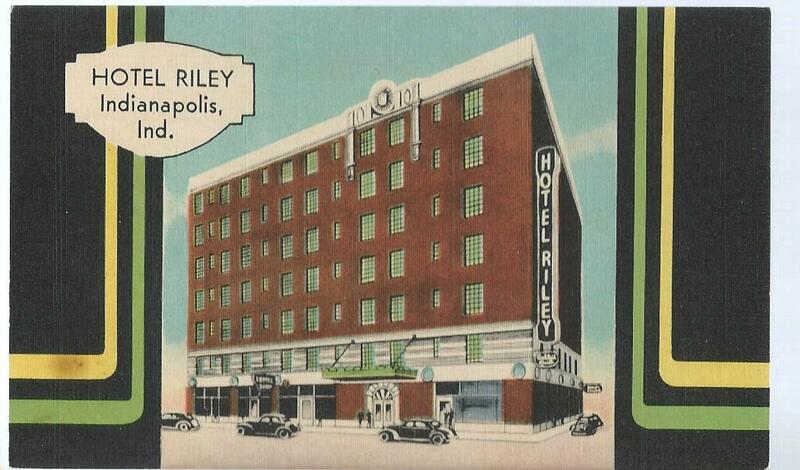 The 1938 remodel of the Daisy was by architect J. Lloyd Allen of Allen & Kelley (John R. Kelley.) The Drawings and Documents Archive at Ball State University has two sheets of preliminary plans and eight sheets of working drawings of the project. Those would be nice to dig out and look over. And yes, the theater was in Haughville, on the north side of Michigan Street across from an old Fletcher bank that is now a Chase. A friend of mine’s mother worked there as an usherette in 1941. Are there any known interior photos of the theatre? Doug, I’ve just discovered an interior showing performers on the stage. I’ll share a copy after I acquire a scan. Let me know if you hear of others. LOL, this made me laugh. Nice article! I realize that this is a 2015 post, but if anyone’s still reading the comments…. 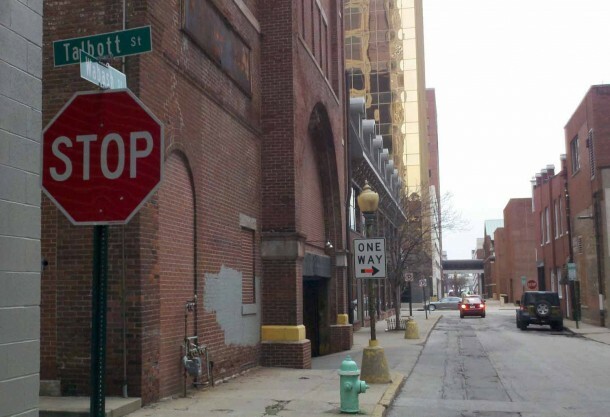 I was told once by someone–don’t remember who–that all of these little alleys downtown were given street names because of a regulation that prohibited theaters (or maybe it was businesses in general) from fronting on alleys. I don’t know if this makes any sense–it would seem to me that the same city government that would be issuing the restriction would also be the entity upgrading the alleys to streets, thus defeating said restriction. Can anyone shed light on this? It might be completely false.